COOKEVILLE, Tenn. (CNS) — They come from different countries and speak a range of indigenous languages and dialects. They are descendants of native peoples who developed one of the most sophisticated cultures in the Western Hemisphere. They are proud members of the Mayan Catholic diaspora now living all across the United States, and they came together at a conference in Cookeville to celebrate their native culture and Catholic spirituality. “It was wonderful, spiritually uplifting,” said Juanatano Cano, national consultant on Mayan Catholic ministry for the U.S. Conference of Catholic Bishops. “The Maya community rarely comes together and meets and celebrates our uniqueness,” he said. Cano and hundreds of other participants met July 7-8 at St. Thomas Aquinas Church in Cookeville, a town about 80 miles east of Nashville, and home to a sizable Mayan Catholic population, as well as a large Hispanic population. 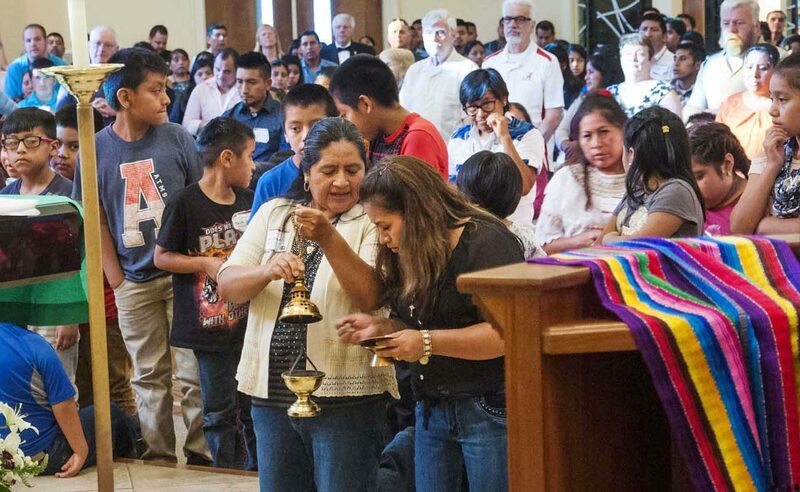 The Pastoral Maya Ministry, part of the USCCB’s Subcommittee on Native American Affairs, has hosted the annual conferences since 1999 to help energize Mayan Catholics and encourage them to serve as bridges between Mayan communities and their local churches. The annual Maya conferences bring together Mayan Catholic leaders from across the country to share ideas and strategies to take home to their communities. The conference for Mayas focused on strengthening Mayan families and preserving their unique culture, with a particular focus on Mayan youth. Gaspar Andres, a recent high school graduate, traveled to the conference from South Carolina with his parents. “I want to learn more about the culture and where my parents came from,” he said. Andres, whose first language is Akateco, learned English in school and is now learning Spanish. “The way kids grow up they don’t want to learn the language and culture and sometimes the parents don’t explain it really good,” he said. For young adults like him, attending the annual Maya conference can be a powerful reinforcement. “The most relevant need of the Maya is to transmit the faith toward our children,” said Francisco Hernandez, a parishioner at St. Thomas Aquinas and the local conference chair. “Our children must never forget their roots, our origin and values. We, and our children, need to feel proud for being Mayans. The day opened with a talk by Father Mat Xun Bernabe, a Guatemalan priest, and included sessions on Mayan identity, music and culture, followed by drama and dance performances. Other sessions guided young people through service opportunities and answered questions about higher education. Present at the conference were young Mayan adults in graduate school, finishing their master’s degrees, or working on their doctorates. “The testimony of these role models spoke for itself to the hundreds of children at the conference,” Cano said. In Tennessee, in addition to Cookeville, there are Mayan Catholic communities in Shelbyville, McMinnville and Knoxville. There was a large migration of Mayas to the U.S. in the 1980s during the Guatemalan Civil War, and many began settling in Los Angeles and then spread throughout the country, with the biggest populations now residing in California, Florida, Georgia, Arizona, Illinois and Ohio. While many Mayas today are proud of both their native and Catholic heritage, the fraught history of the Catholic Church with the indigenous Mayan people cannot be ignored. The first Spanish conquistadors and Christian missionaries to come in contact with the Maya hundreds of years ago nearly destroyed their culture. However, since the Second Vatican Council, Cano said, “the church has been changing the way it sees indigenous people. There is more appreciation of our culture.” He noted that St. John Paul II encouraged native people to celebrate Mass in their own language, and Pope Francis has apologized for the damage caused by the Catholic Church to native people.